I joined Ravelry just over a year ago. What a wonderland that is! 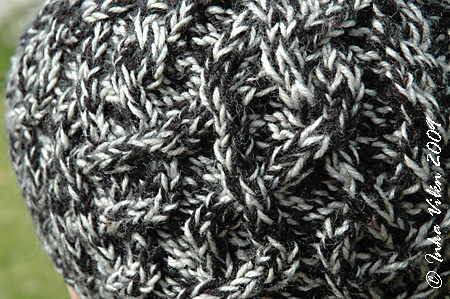 I follow several knitters who are inventive and creative (and knittaholics, judged by the number of the projects they’ve completed), and thanks to them I’ve found a lot of interesting patterns and ideas. Since I joined Ravelry, I’ve kept a track of my projects there. So far I’ve completed, I mean really completed, only a few garments. The number of UFO’s is extensive, though. To complete my knitted oldies collection, I’ll present you the FO’s of last year, few in number. May I present: caps with cables. 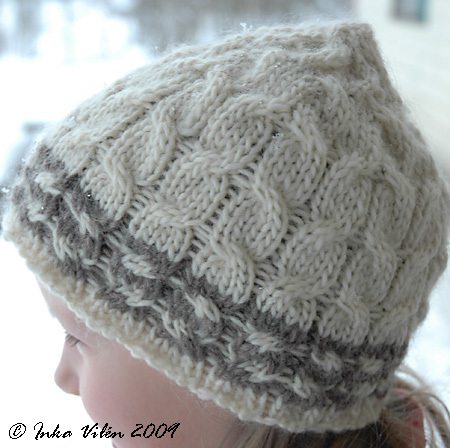 At christmas I was inspired by Novita Stone, 100% wool yarn. I bought three skeins, one of each color available, and decided to knit caps for kids. Decided on cables, since they are fun to knit. The first cap was hidious to make. Took me a few tries to find the right amount of stitches to make the cap fit nicely. Once I reached the point to make decreases, I faced the knit-and-rip-syndrome again. After several attempts I managed to make the decreases nicely, and the outcome was all worth it. Once the first one was made, the other two were easy – even though I made the cables different. 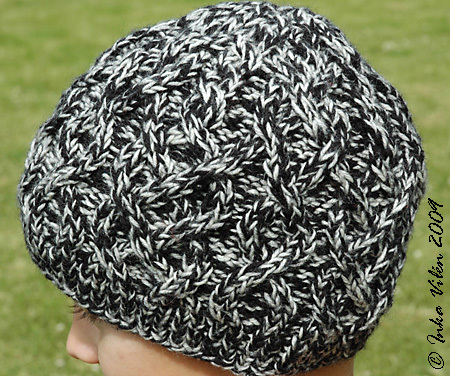 The caps were in active use until weather turned too warm for wool. Saw Habibat in many blogs and all around Ravelry. 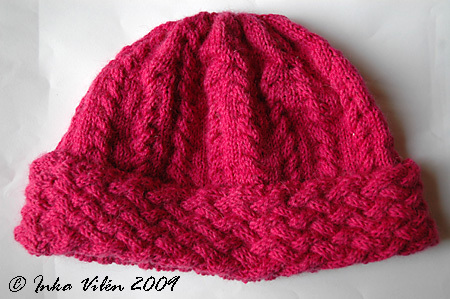 Loved it, bought the pattern, pondered over yarn and decided on Novita Wool (100% wool) doubled. 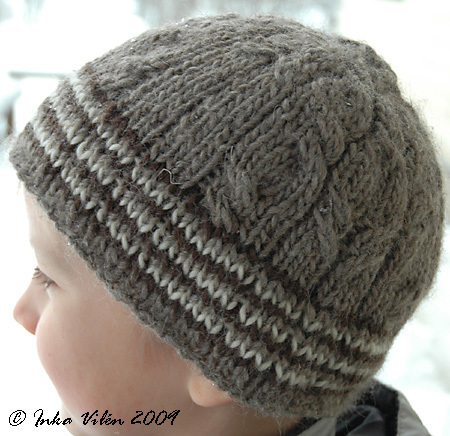 It was a fun project to knit, though all the cables required quite a bit of attention. In the future I’ll make some more Habitats. The final cable cap was a disaster. Made out of Novita Nalle, it turned out too sloppy and big and all. Didn’t want it to be to tight, but the outcome was ridiculous. After the first time worn when skiing the cap was way too big. Perhaps it’s the yarn, perhaps the cables used, but this was hidious. Perhaps I’ll try to felt this a bit. As it is, it is not practical. Next in knitting, moving on to projects at hand. But there are still more oldies to come: plenty of sewing, dance costumes and jewellery. 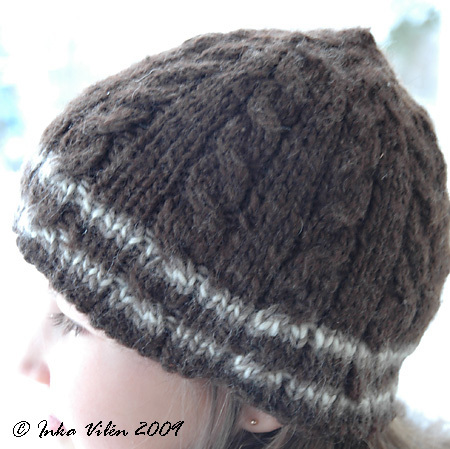 This entry was posted in oldies, yarn work by Inka. Bookmark the permalink.